Honey loves Heatherlea. She inherited a wonderful home there, she has her own studio where she can work on her art and she has good friends. She meets them every week at the Cosy Cottage Café. She's also seeing Dane from time to time, a kind and handsome teacher, and would love for them to become close, but her past keeps holding her back. Will Honey be able to conquer her insecurities and give love a chance? Dane works incredibly hard. He has a temporary position at Heatherlea's primary school and enjoys it so much that he wants nothing more than to become a permanent member of their staff. Falling in love is the last thing he needs when he's so busy, especially because he doesn't know if he'll be able to stay. However, Honey proves to be hard to resist. Will he realize that he has to make time for the woman of his dreams before she fortifies her walls? 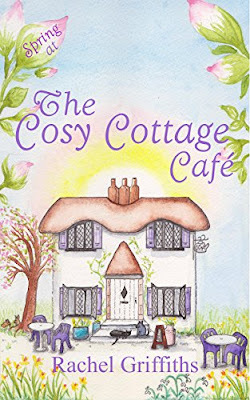 Spring at the The Cosy Cottage Café is another wonderful heartwarming story by Rachel Griffiths. Her main characters are both incredibly sweet. Honey has a good heart, but it isn't easy for her to tell people everything about herself. Her past has made it difficult for her to let people come close, but the comforting friendship of the ladies at the Cosy Cottage Café slowly makes her come out of her shell. Dane is a gentle and caring man and he's perfect for Honey. I kept hoping they'd overcome their obstacles, so they could give love a chance. It's clear from the beginning they're amazing together and I couldn't turn the pages quickly enough to find out where their story would lead. Rachel Griffiths has a delightful sense of humor. She made me laugh out loud many times while reading Spring at the The Cosy Cottage Café. It's a fun feelgood story filled with wittiness and light. The story oozes charm. To give it depth as well, Rachel Griffiths balances this with the seriousness of Honey's past and this combination works really well. The result is a fabulous complete story that left me with a big smile on my face. If you love funny feelgood stories you don't want to miss The Cosy Cottage Café series. The books can all be read as standalones, but if you want to get to know each character through and through I'd advise you to start with the first one and read the stories in their correct order. I've read the reviews on Goodreads and yours was one of them. I am really excited to read this series, sounds so heartwarming and funny. It sounds like a very sweet story. I will love this book. Such a warm and beautiful cover. Sounds like Rachel Griffiths has done it yet again! This one is just what the doctor ordered after a long week of work. And I adore that cover! You got me intrigued.I'm adding it to my tbr, and the rest of the series too! It looks like a sweet book. I really love the cottage cover. What a lovely cover! And sounds great, looking forward to read! I love these kinds of stories. I don't know if I've read anything by this author but I'll definitely be looking for her books. This sounds like a great book. I will have to check this out. Thanks for the review. Sounds indeed heartwarming, and I love witty character andand cott cafe. The book cover itself is pretty and inviting.